This board displays my color scheme. 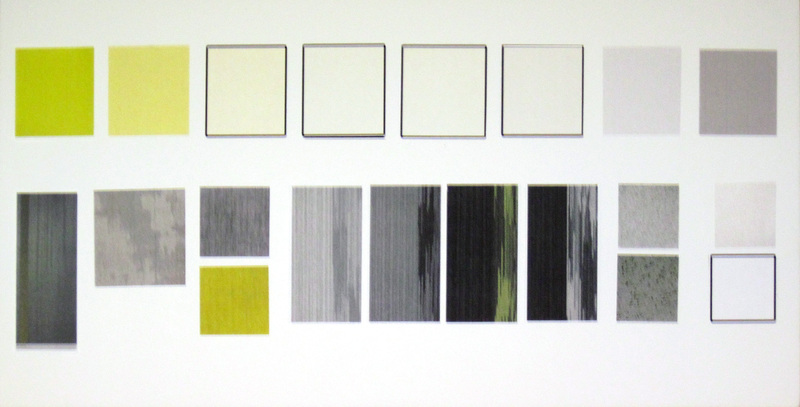 Obviously my POP of color, Chartreuse a warm, yet subtle, cream, almost whites, and cool greys. The carpet tile to the left is by SHAW and is used throughout the facility, especially in corridors, admin offices and the entrances. The second image is a carpet tile from JJ-Invision that is gorgeous in person. This will be used in viewing areas, instructor offices as well as the conference room. The next two tiles are VCT from Johnsonite and the majority of the room will have the charcoal color and the chartreuse color will be placed sporadically. 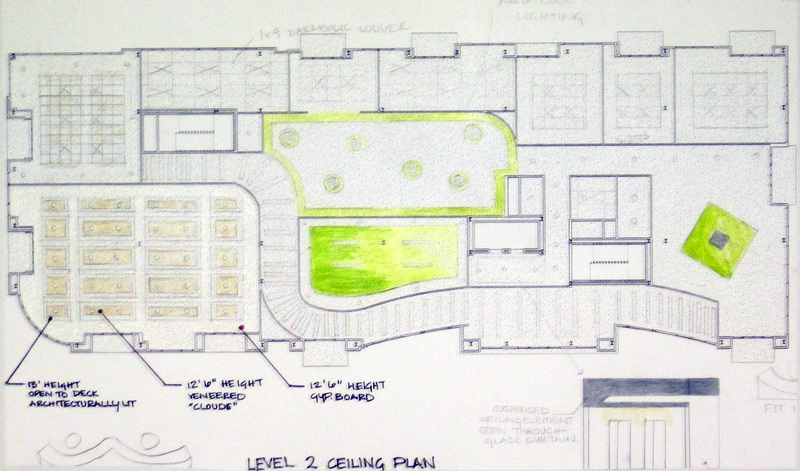 Do not mind the light fixture spacing in the ceiling plans, these are sketches/ideas. 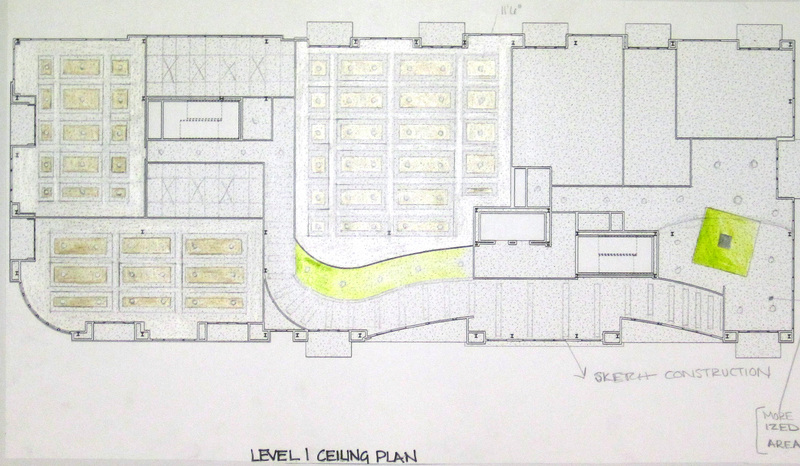 A more accurate plan will be done in Revit for the final presentation. 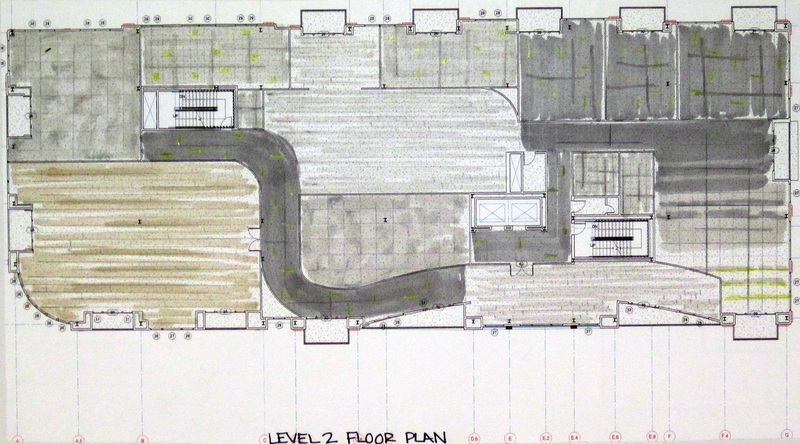 Floor and ceiling plans show transitions in space as well as circulation/way finding patterns. Curvilinear elements as well as pops of color are introduced to create an experience for each and every user. The dance studio has a ceiling that creates interest in the space. The squares on the ceiling are wood veneer that mimic the same finish as the flooring, and are surrounded by mill work, creating a coffered look. The fabrics from Knoll are going to be used for the drapery over the windows in the space. The wall will be painted with the same two-tone colors to create a space that isn’t broken up and enhances the concept of movement. The drapes are mounted on the mullions in between the windows and the doors to allow for daylight to penetrate the space even when the drapes are closed, providing the look of clear story windows. The 4 finishes of wood are displayed, because I have yet to decide on which finish I want in the space. All of the styles are either Oak or Maple, which is optimal for a dance studio, reducing the wear due to the inherent strength of the natural material. The carpet tile is from JJ-Invision which will be used to create a transition within the studio for guests or people with street shoes, since street shoes are not allowed on the hardwood floors. Movable bars will be used to accommodate for more people using both sides. Plus, the fact that the perimeter of the room is surrounded by glazing, affixed ballet barres would have been nearly impossible. 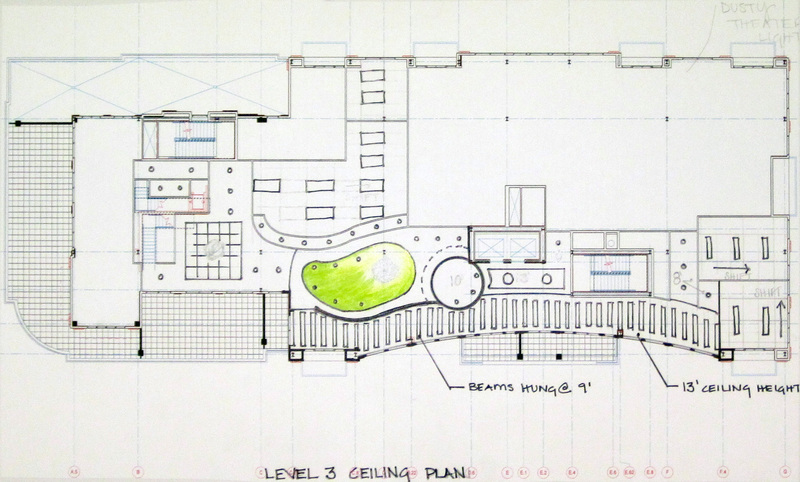 This space has not yet been developed for the final design. However, the finishes have been chosen. 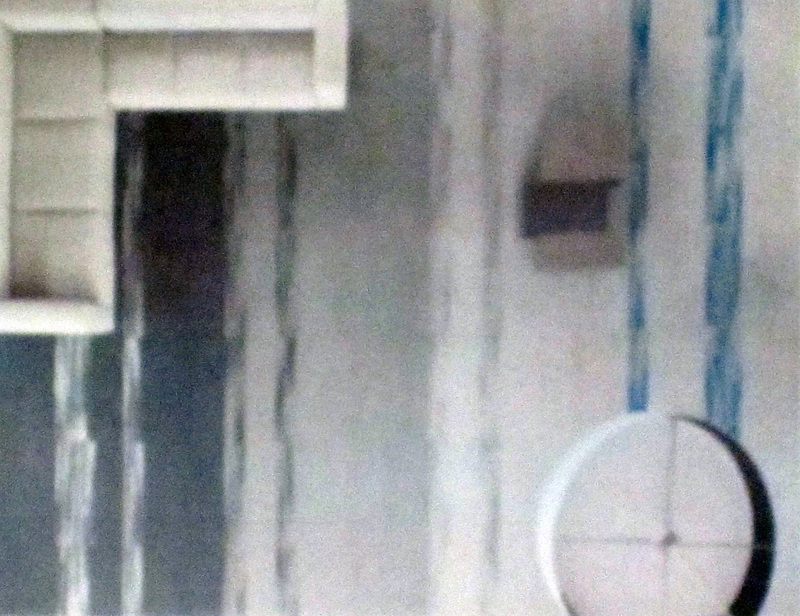 The pendants can be seen suspended through the holes in the “cloud” ceiling, or displayed above banquet seating underneath the overhang (not seen in sketches). The hardware chosen for the cabinets is very sleek and minimal. 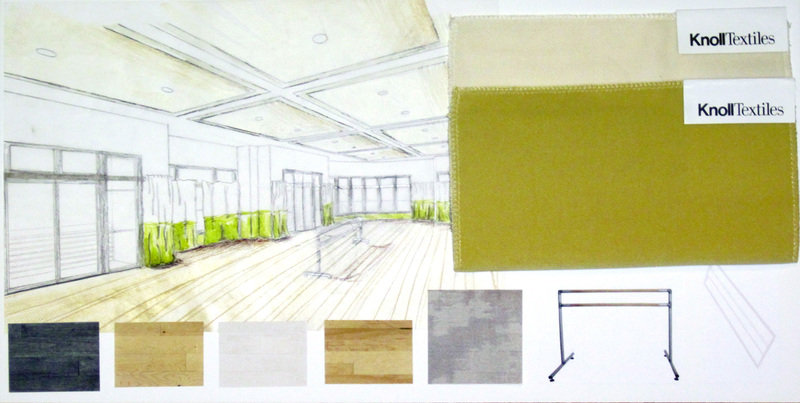 The lounge and dining chairs will both be upholstered in the green fabric from Pallas Textiles. The tables are from Coalesse. The cabinet veneer is from Wilsonart and it is in Designer White, while the counter top is one of the 3 finishes from Icestone. The flooring is, as described before, the Striations from Armstrong in Steel. The arrival space’s design has been hammered out and finalized. The finishes are displayed above, including the metal coil screen dividing the waiting area from the reception desk, the custom-made lighting beams that will bring the corridors down to human scale and provide movement within the space. The carpet tile from Shaw Contract Group will be used in the elevator entrance while the Striations tiles from Armstrong will be used in the corridors. The veneer for the reception desk is from Wilsonart and is in Designer White. The countertops will either be Wilsonart’s solid surface in Designer White, or either of the 3 finishes from Icestone. The benches shown above will be placed in the corridor and covered in the fabric from Pallas Textiles. 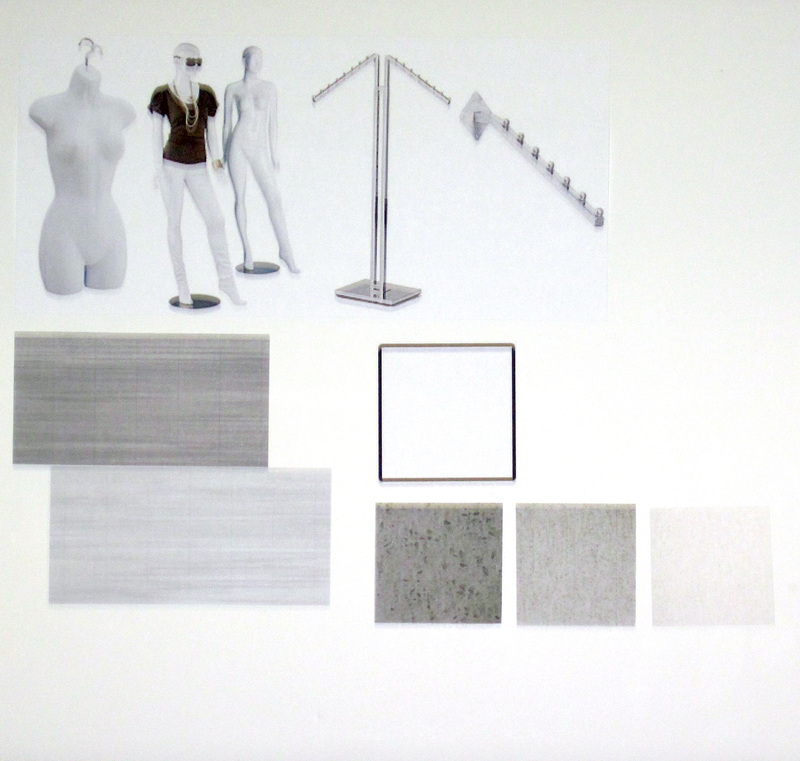 These are the finishes and fixtures chosen for the store so far. 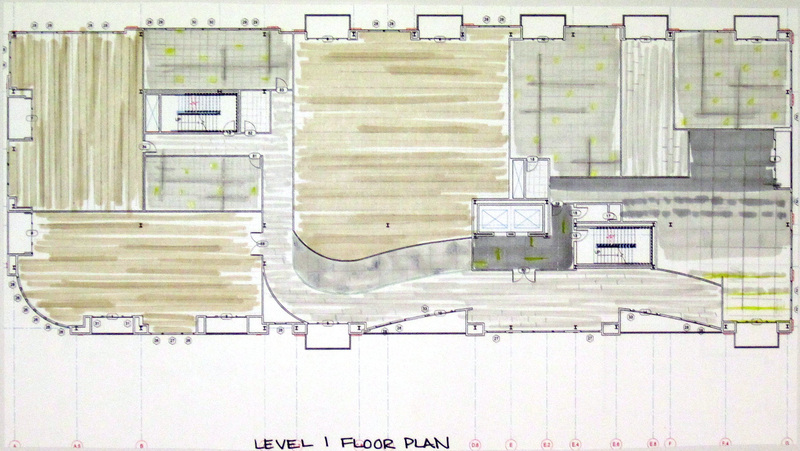 We have not yet had a charette over this space, so I have not drawn sketches for it. 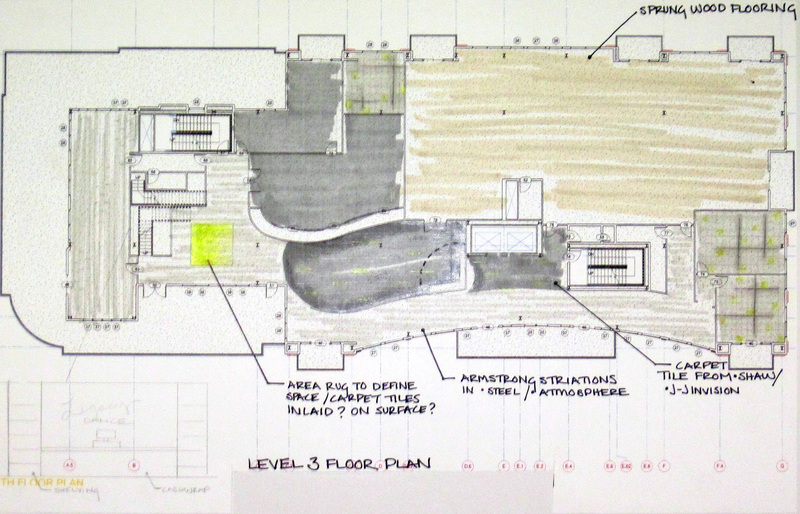 The Flooring in the space will be a mixture of Steel and Atmosphere Tiles from the Armstrong Striations collection. The cashwrap veneer will be Designer White from Wilsonart. The countertop is one of the three Icestone solutions seen above. 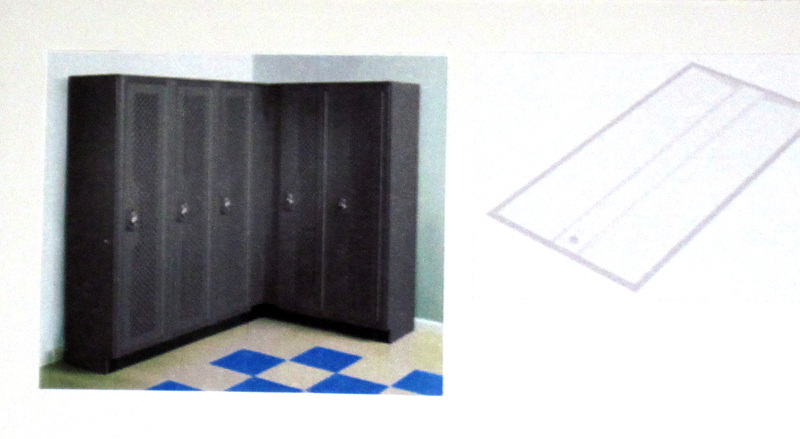 The only furniture chosen for the locker room so far are the lockers. They are not metal, and therefore do not rust or mold. The light fixtures are 2×4 fluorescent fixtures that provide even diffuse light.